The Tablet That Transforms to Match Your Work Style. Rugged Redefined. The transformational 2 in 1 device gives you all the high performance capabilities and complete computing functions you need in a single platform. You’ll have the right connectivity and ergonomics for a quick transition from the field to a full desktop computing experience – and the most conveniently stored Companion Keyboard on the market. It's fast to deploy when you want a notebook, and even easier to store when you don't. 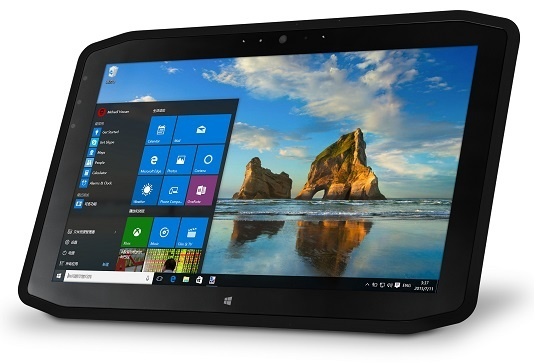 This makes the XSLATE R12 rugged tablet much more evolved than traditional detachable tablets, improving upon its own award-winning R12-series predecessor. Rethink What a Rugged Tablet Should Be. See All (the PCs) That It Can Be. You just need the highly mobile, extremely flexible and always resilient Xplore XSLATE® R12 tablet PC. The transformational 2 in 1 device gives you all the high performance capabilities and complete computing functions you need in a single platform. You’ll have the right connectivity and ergonomics for a quick transition from the field to a full desktop computing experience – and the most conveniently stored Companion Keyboard on the market. It's fast to deploy when you want a notebook, and even easier to store when you don't. Xplore XSlate R12 Rugged Windows Mobile Computer - Win10, SlateMate HF RFID, UK Companion Keyboard - XSLATE R12 - Intel Core i5 - 6200U, 8GB RAM, 128GB SSD, WWAN (NA&EU), Win10 Pro, UK Power Cord, SlateMate HF RFID, UK Companion Keyboard, With Smart Card Reader, 3-Year Standard Warranty. Xplore XSlate R12 Rugged Windows Mobile Computer - Win10, SlateMate, Barcode Reader, RFID, Smart Card Reader, no Companion Keyboard - XSLATE R12 - Intel Core i5 - 6200U, 8GB RAM, 128GB SSD, WWAN (NA&EU), Win10 Pro, UK Power Cord, SlateMate BCR/RFID, No Companion Keyboard, With Smart Card Reader, 3-Year Standard Warranty.